Last week I wrote a post about the transition from work to retirement, from a professional wardrobe to a more relaxed, casual “Sunday Style.” You can read that post here. This transition can be challenging even if you start the process a couple of years before you retire, like I did. The transition, for me, is challenging partly because I loved some of the stuff I wore to work… like suits, especially pant suits. Partly because my wardrobe needs are so different now. And partly because our climate (namely winter) can throw a monkey wrench into even the best laid fashion plans. Not to mention the fact that I have lots of lovely things in my closet that I should be wearing more, once I figure out how to wear them… as casual, not professional, wear. Things like my long, winter cardigans. I started thinking about the cardigans I own and am not wearing, when I saw a post on the fashion blog Not Dressed As Lamb. Catherine had styled this long, light coat from ASOS.com. It’s more of a sweater actually, than a coat, and it looked lovely on her. And then these sweaters from Net-a-porter.com caught my eye. Why wasn’t I wearing my long cardigans more? I own several, and haven’t worn them much, if at all, in the last two years. So, I dove into my closet and came up with four winter cardigans that I once wore regularly to work. And I endeavored to refit and refresh them to suit my new, more casual, life. Or failing that make the decision to recycle them…. at the thrift store. I used to like to wear this grey Judith and Charles sweater with black, skinny dress pants, a white ruffled blouse and burgundy ballet flats. 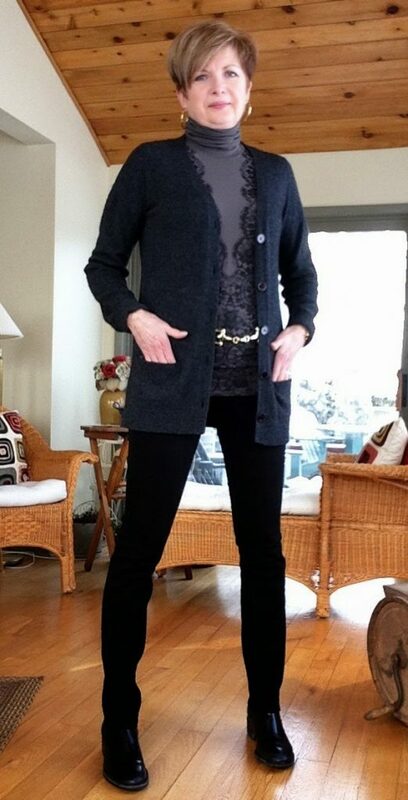 Maybe it will take on new life with my black J-brand jeans, black boots and this grey turtleneck with lace applique? I wore the turtleneck to work with dress pants and high heels. But I like it under the sweater. A black leather and gold belt, and gold earrings add a tiny bit of bright. This look is still a bit “work-y”, but I’d wear it to lunch with the girls. I just need a bright scarf for under my coat, one that isn’t grey or black. This long, red cardigan from Banjo and Matilda is one of my favourite back-to-school purchases from a few years ago. Now, I wear it mostly in the fall as outerwear, with jeans or my leather pants. And not much at all in the winter. But, I quite like it with my black boots and jeans, this striped Gap tee shirt, and my Michael Kors animal print scarf. Yep, I like this outfit. In fact I like this look better than the first because the scarf is part of the outfit… indoors or out. And looks great with my down coat. Which brings me to this sweater. 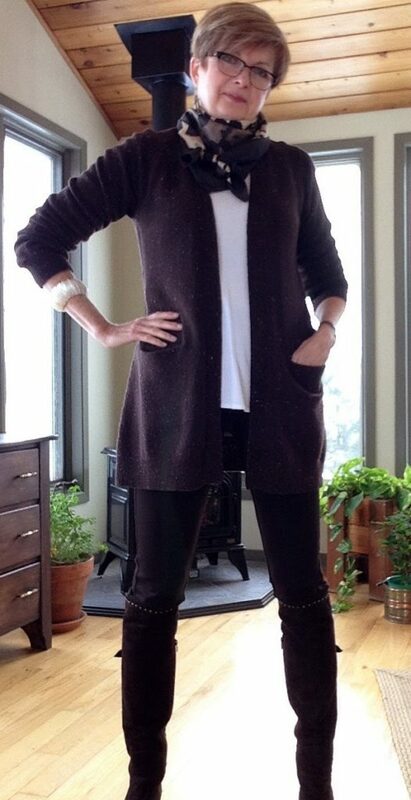 Long, chocolate brown, heathered wool, I wore it to work with these brown, skinny NYDJ pants and heels. But I’ve never tried the pants tucked into my knee-high, brown boots. In fact, I’ve only twice made it out of the house with skinny pants tucked into boots. Fashion cowardice, I know. And I seriously love these leather and suede boots. And to have worn them a total of twice, that’s scandalous! You see, I have trouble embracing the pants-inside-of-boots look. I wore it in my twenties. But now, with my long skinny legs, broad shoulders… and middle age middle… I always feel that I look like an inverted triangle. Still, maybe with this long sweater.. I might be brave. Except that the temperature this week in Ottawa will barely creep above -20 Celsius. 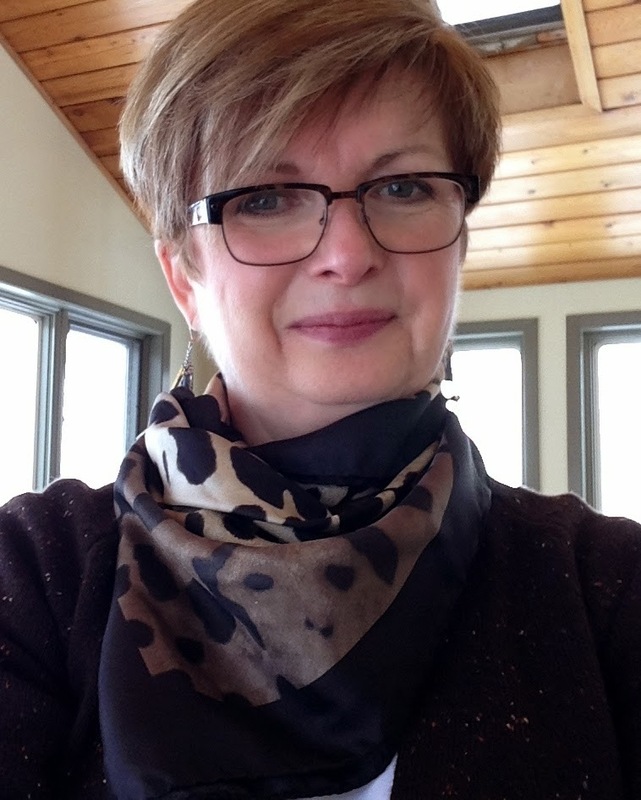 And as much as I love this cream, brown, and black silk scarf…. it won’t keep me warm. And so I switch up the scarf for this woolen beige and burgundy one, which looks good with the coat, but not great with the sweater, when I take the coat off. Hmmmm. Now that I’ve hauled these boots out of the closet, I really want to wear them, just not with this outfit. So I tuck the brown sweater back in the closet and pull out that new wardrobe staple, my cream turtleneck from Gap. It looks great with the brown pants and boots. And will look good with that heavy beige and burgundy scarf, and my down coat. Not a cardigan refresh, I know, but still, I am wearing boots and pants that were in need of some love and attention too. And tomorrow, I am planning to throw fashion caution to the wind and wear those high brown boots, with my tucked in pants and that cream sweater, for coffee with a friend. Bravery… thy name is Sue. You know, dear readers, retirement is not for the faint of heart. Because my wardrobe isn’t the only thing that’s getting refitted and refreshed. It seems I myself am a work in progress. Stay tuned for future developments …maybe…”Sunday Style… Attitude Adjustment.” Or something. Meanwhile, how are you coping with your fashion challenges this week? Linking up with Visible Monday, Share in Style, Manic Monday, Passion 4 Fashion, Style Me Wednesday, What I Wore, Fab Favourites, and Let it Shine. I love the long cardigans! Your red one with stripes and leopard is so much fun…these are great looks for your current lifestyle. I saw some over on the Talbot's site on sale which were great. Thanks Pam. Cardigans make a great change from all my turtlenecks! Thanks for reading. My grandfather used to say that I was "nine axe handles tall and just as wide"…in those days being skinny was NOT a compliment. But I do wish the top half of my body had not turned into the classic apple shape somewhere in my early fifties. Hope you are staying warm in my favourite part of the UK. my winter challenges are very different than yours. i live in the gulf south where temperatures fluctuate wildly in the winter. we can have highs in the 70's (farenheit) one day and in the 30's the next. today our highs will be in the mid 40's but over the weekend, 60's are predicted. i guess the solutions is layers that can be added on or peeled off as needed. most of the time a heavy blazer will be enuf of a topcoat for me. i also love the red cardigan outfit and would wear it if i could. i find i hardly ever wear high boots, tho, because even on a cold day, they are uncomfortable once i get inside wherever i'm going. i adore booties and ankle boots, tho and have several pairs in rotation. That's exactly why I have worn those boots so seldom…I would have felt funny wearing them all day at school. And they would have been too hot. But out for coffee in the winter we're having they will be okay. I have one pair of ankle boots and am now thinking that I should invest in a second pair since I wear them so often. Thanks for reading, Susan. I finally wore the boots for my coffee date today. Felt very chic. And not like mutton dressed as lamb at all! 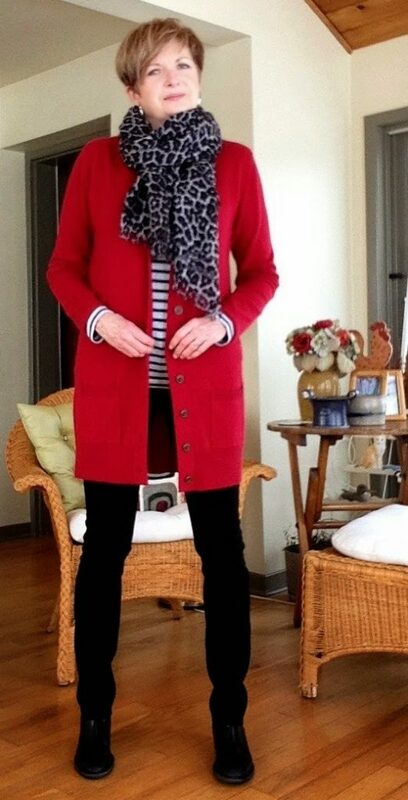 Love the red cardi outfit, and I adore the boots tucked inside the pants! Fabulous! That picture of the boots from the back looks like a young model is wearing them. Embrace those skinny legs, I know I've embraced mine 🙂 They were made for high boots. Besides, canadian winters were made for skinny pants and high boots. Thanks for the kind words and encouragement, Melanie. And thanks for stopping by. Long cardigans & oversized sweaters are must haves for me in the cold weather! You're right. I just needed to make a point of wearing mine more. Thanks for reading. I've read both these posts thinking ahead to my own retirement and wondering how my wardrobe will make the transition. And I have to echo all those votes for the red cardi outfit here. And for those boots! Glad you're taking them out a bit now — they deserve!! Thanks Frances. Those boots made it out into the world on Friday. I like long cardi's but you have always to remember to wear a long coat over the top! Your coat is lovely on you and I just love your studded boots! I know what you mean. I love my red cardi..but it doesn't fit under all of my coats. Thanks for stopping by, Lorna. Thanks for the vote of confidence, Nancy. Trust me…there's an apple shape there! But I'm rockin' those boots all the time now!